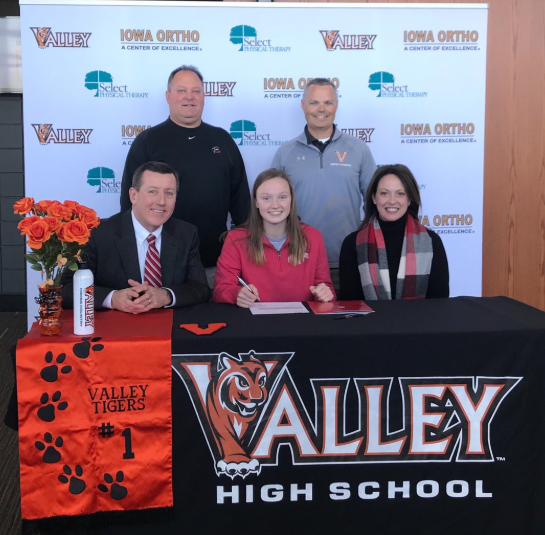 Helen Gould of Valley High School in West Des Moines announced her commitment to run cross country and track and field for the University of South Dakota on November 13th, just one day before signing her letter of intent. Gould, who can boast top 30 finishes every year of high school at the State XC meet has clocked PRs of 18:38 for 5K (XC), 10:29 for the 3000, 4:43 for 1500, and 2:18 for the 800 has also achieved four top-8 finishes at the State track and field meet. 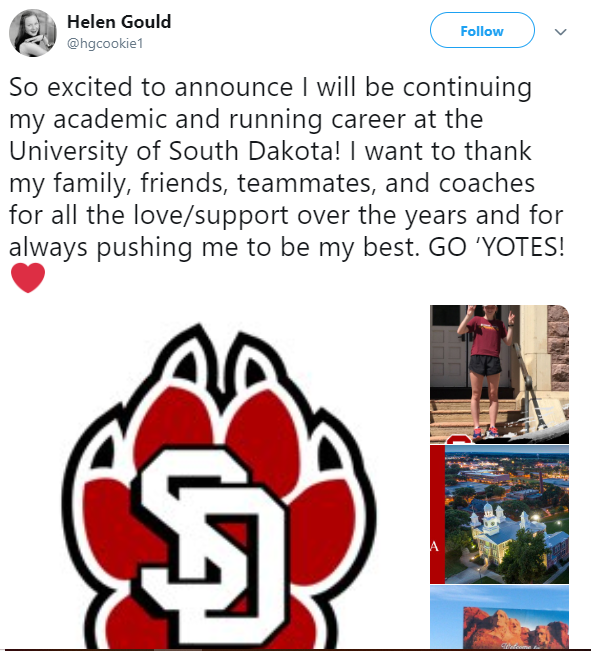 As another elite recruit for Iowa this year, Gould decided to take the route of Division I athletics and will be a USD Coyote this upcoming fall! 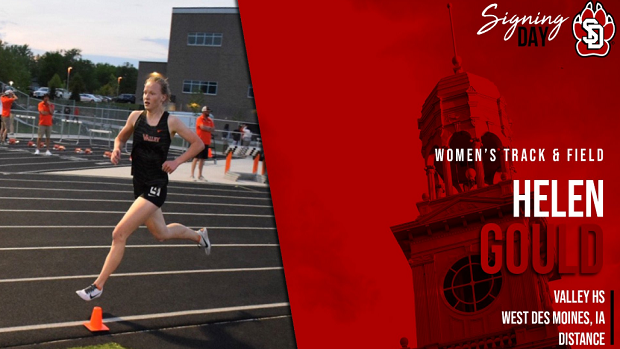 Read on to hear more about her roots and the decision to further her career at South Dakota. How did you get started in XC/TF? When I was younger I played soccer and was always very invested in that. In fourth grade I broke the school record in the mile, after this my PE teacher encouraged me to continue competitive running. When I was in 5th grade a parent started a running club at my elementary school where kids could come and run laps during recess. I really took to this. I'd run laps around the soccer fields, everyday at recess, and then joined cross country in middle school and continued! What is your favorite track event and why? The 1500m definitely has my heart. I love the distance of it, sometimes the 3000m can seem long and the 800m is short but pretty fast. The 1500m is just right! When did you start considering running collegiality? I think I always knew I would want to continue running in college. I wasn't sure where or what division until later in high school, but competitive running has always been a large part of my life, so I couldn't imagine it ending after high school. What schools were you interested in and why? I wanted to find a school that was not far from home, so all my visits were relatively close. I visited South Dakota unofficially before my junior year. After my first visit I really liked the school, the coach, and the training philosophy. I quickly found myself comparing all other schools to South Dakota. When I came for my official visit I really liked the team and knew it was going to be a good fit! Did you take any official college visits? If so, what was that experience like? I took several official visits, wanting to closely compare schools, coaches, and team chemistry. It was a great experience, taking official visits allowed me to examine the schools and the programs in more depth. The more I examined the more I found South Dakota was a great fit for me. How did you end up deciding on the University of South Dakota? I took many different factors into account. Some of the most important to me were academic programs, distance from home, and quality and feel of the program. On my visits I enjoyed what I saw and could see myself going there. What field of academics are you interested in pursuing? I have many goals but simply said my goal is to be a top performer in multiple events at the state track meet, and lead my team in being a top finisher. Part of achieving these main goals is staying on top of all the little tasks such as getting enough sleep every night, fueling properly, or completing strength exercises. By practicing simple daily disciplines, that are so easy not to do, I am confident I can accomplish my goals. What would you like to accomplish during your time as a Coyote? I want to improve my times to be a regular scorer on the team. I'd like to be a top performer in the conference meet and eventually participate in the NCAA track and field meet.